LONDON, England -- Russia says a London bank account held by its state-owned media behemoth Rossia Segodnya has been “closed” by British authorities in a move it linked to Ukraine-related sanctions imposed by the EU. Rossia Segodnya chief Dmitry Kiselyov at the launch of Sputnik in Moscow on November 10, 2014. 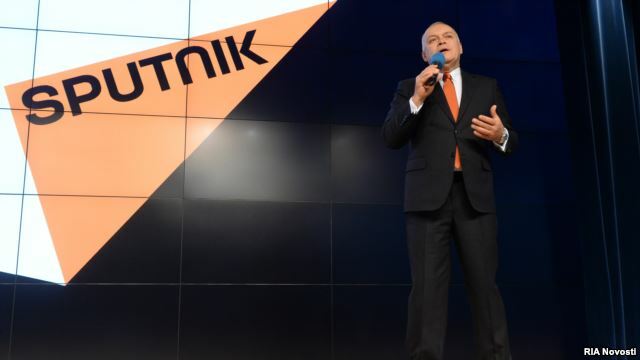 Russia’s Foreign Ministry said on July 13 that the media conglomerate’s account with the bank Barclay’s was closed in connection with EU sanctions against Rossia Segodnya chief Dmitry Kiselyov, who delivers bombastic anti-Western tirades on his nationally televised weekly news program. Rossia Segodnya’s representatives “were not informed about the fate of the funds,” the ministry said in a statement. Western nations have accused Russia’s state-owned media of disseminating “propaganda” in its coverage of Russia's conflict with Ukraine. More than 6,600 people have been killed in a war between Kiev's forces and Russian-backed separatists that erupted in April 2014, and hostilities persist despite a European-brokered cease-fire deal. Kiselyov is one of numerous Russians -- including senior officials and wealthy businessmen close to Russian President Vladimir Putin -- sanctioned by the EU in connection with Russia’s role in the Ukraine conflict. He was hit with an EU travel ban and asset freeze in March 2014 in response to the Kremlin’s annexation of Ukraine’s Crimea territory a month before the fighting broke out in eastern Ukraine. The United States has sanctioned many of the same Russian individuals and companies targeted by the EU but has not imposed these measures on Kiselyov, whom the EU calls a "central figure of the government propaganda machine supporting the deployment of Russian forces in Ukraine." The Kremlin denies it is backing the rebels despite mounting evidence to the contrary. Russia’s state-run RIA Novosti news agency cited a Barclay’s representative as confirming that Rossia Segodnya’s account with the bank had been closed. The agency cited an unidentified source with the bank as linking the account’s closure to the sanctions against Kiselyov. Rossia Segodnya was established by a Kremlin decree in December 2013 in a move widely seen as a Kremlin bid to establish even greater control over the state-run media’s news coverage. The media holding integrated RIA Novosti and state radio station Voice of Russia into a single media monolith.